Tips on Chopper Kits Including What To Get! If you are interested in building a chopper, then you should consider shopping for chopper kits. Basically a chopper-kit is a bike in a box. Kits allow you to build a lean, mean speeding machine with your own hands without having to create and/or buy custom parts hoping they will fit your custom chopper frame properly. It is significantly easier to build your own kit bike rather than build a totally pure custom made chopper. What's The Difference Between A Chopper Kit and A Custom Chopper Kit? Answer: Very little. There are many debates over this topic. And it depends on whether you are speaking with a custom chopper purist who insists that a custom chopper is not truly a custom chopper unless you build every part yourself, or a biker enthusiast who is not as particular about the parameters that the purist puts around the custom chopper definition. Otherwise you might consider a regular chopper kit to be one that is mass-produced by chopper kit manufacturers. 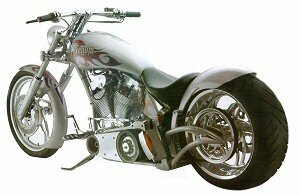 Chopper kits can be produced by a smaller custom chopper builder that is not as well known, or you can get one from well known manufacturers. For example, although Jesse James is now a well known custom builder, he sells tons of kit bikes. He also has most of the parts custom made from other companies. However, don't build your own chopper unless you have a basic understanding of the basic mechanics behind choppers. And being a little handy with tools is a big bonus. Sometimes it is only a little more expensive to take the custom chopper-kit to a motorcycle shop or a local mechanic and have it assembled for you. This is a good idea if you are impatient, are "all thumbs" or become dyslexic the minute you are presented with complicated "do-it-yourself" instructions. Shopping for a kit is the same as shopping for a regular motorcycle. One of the best places to buy a kit bike is on Ebay...See Below. After purchasing your custom kit, you should do yourself a favor and make sure that you have been sent all the parts that are needed for constructing the machine. Also, some kits come with dvd instructions. These videos may be a big help. Ask the manufacturer or dealer if you chopper kit has one. It doesn't really matter what part of the bike you decide to build first, as long as you follow the directions carefully for building that component. Most people start by assembling the motor first, but others prefer to begin by assembling the front wheel and steering of the machine. There is no "right" way except the way that you envision as causing you the least confusion. One rule of thumb is to resist painting the bike parts before you have assembled the chopper. This is to ensure that if you drill a hole in the wrong place that you are doing it on the sheet metal, rather than on a surface that is supposed to ultimately resemble a $2000 paint job. Assembling a bike from a kit can be a frustrating experience no matter how adept you are at mechanics. Many find themselves on the verge of giving up after trying to thumb wrestle a single screw into a mount for two hours. This is the point at which you have to remind yourself that the same thing happens when you try to assemble something much more simple, such as a bed-frame from Ikea. Sooner or later you will feel more rewarded as your tangle of metal and wires slowly begins to take the shape of a real chopper. Like any project, the key to successfully building a chopper is to apply determination, persistence and patience to every step of the process. There are no good videos or dvd's on the market that show you what you need to know about how to build a kit bike. But there is some good reading material. We recommend this book: Build A Chopper Kit Bike. Even the most resourceful and handy of individuals experience despair at the mid-way point of building such a complicated machine. One way to avoid feelings of futility that might lead you to believe the project will never get done is to make sure that you are very organized when it comes to the storage of your tools. Sometimes in our haste to see the finished project we create chaos which instantly undermines the overall goal. Keeping like items together and assigning a tool to a permanent place once you have finished using it will allow you to maintain a Zen-like countenance while constructing your custom chopper. If you reach a pinnacle of frustration, you can also purchase videos about how to build a chopper on the Internet. I recommend this video/dvd series for any custom chopper project, including kit bikes. Of course they will be impressed once you inform them that you built it with your very own hands. Subject: Bike in a box. I just watched your BYOB DVD and loved it! Who do you recommend that I purchase my first bike kit from? PS: You presented the information clearly and very well. There use to be a ton of bike in a box kits out there to pick from which seem to have faded out over the years. I would look in the Drag Specialties and Custom Chrome catalog to see what they have to offer. It will also depend on what kind of style you are looking for. One of my favorite companies as far as style goes is Sucker Punch Sallys (picture above). 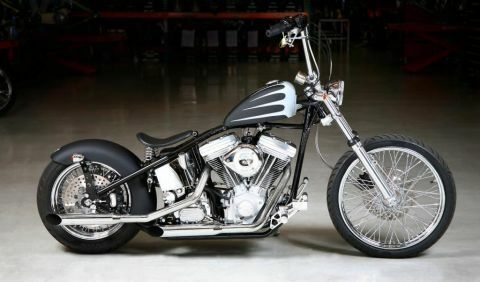 How To Build Custom Choppers And Kit Bikes. This is A must have set of bike building and metal working video's/dvd's for any motorcycle/chopper builder of any level.